One of the great pleasures of summer in Keene, NH is our New England Collegiate Baseball League team, the Swamp Bats. I tell people that going to one of the Bats’ home games at the high school’s Alumni Field is like winding the clock back fifty years and bringing a Norman Rockwell painting to life. Fans arrive early and set up lawn chairs along the first base line. Kids run potato sack or frozen T-shirt races between innings. College players from teams around the country, some destined for the big show, remind you how sweet the little show can be. 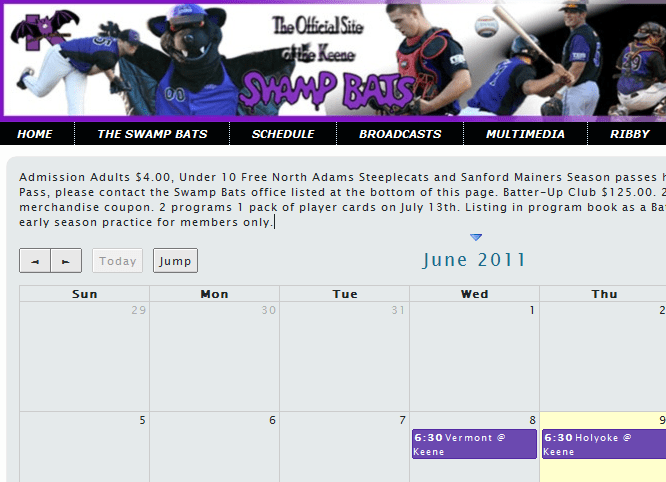 Of course the Swamp Bats schedule should syndicate through Keene’s calendar hub. And last year it did. 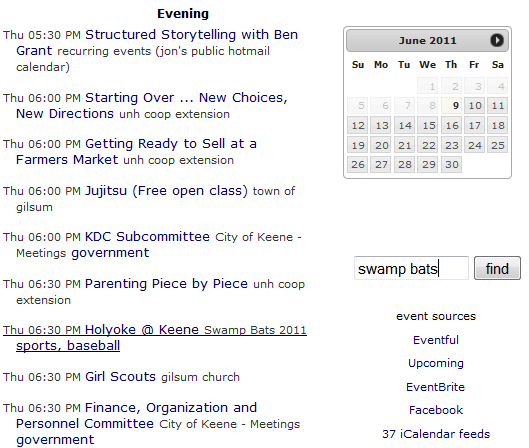 The Swamp Bats site was using Google Calendar, which provides an iCalendar feed, so I just added that feed to the hub. This year there’s a new website based on the Joomla content management system. When I first looked at its rendering of the schedule, my heart sank. The iCalendar feed was gone! No longer are you forced to use an i-frame and settle for a less then ideal look. Now you can integrate a Google Calendar directly into your website – using AJAX. This extension pulls directly from your Google Calendar within Google and displays it directly on your website. Fair enough. The standard IFrame method for displaying a Google Calendar widget is, indeed, less than ideal. But in the process of wrapping the widget so that webmasters can make pages that look nicer, the iCalendar feed was left on the cutting room floor. That deprives visitors to the Swamp Bats website of the opportunity to add the Swamp Bats calendar to their personal calendar programs. It also prevents the Swamp Bats calendar from syndicating through an elmcity hub or directly to media outlets. This omission isn’t an exception, it’s more like the rule. Web designers and builders obsess about how sites look, but typically ignore how they connect — or don’t — to the emerging web of data. As a result, I had to ferret out the hidden Google Calendar in order to connect the Swamp Bats schedule to the elmcity hub. I’ve also subscribed to the feed in Outlook, so I can see the games as an overlay on my personal calendar. Another Swamp Bats fan could do the same in Google Calendar, or Hotmail Calendar, or Apple iCal, or any other standard calendar program. All’s well that ends well, I suppose, but geez, it really shouldn’t be this hard. Web designers and builders ought to think like the web. If you regard the web is an interactive experience, they do. But the web is also an ecosystem of linked data. That way of thinking has, so far, tragically failed to sink in. Web pros! Wake up! There’s more to this game than achieving the “ideal look.” When you are working with data, please make it available as data to the people and the systems that need it. 1 What about the second item? That calendar is empty. It seems the intent was to provide two calendars, one for home games and the other for away games. But in fact, for some reason, the first calendar has both, and the second has none. Great post. I was checking constantly this blog and I’m impressed! Very helpful info specially the ultimate section :) I care for such info much. I was seeking this particular info for a very long time. Thanks and good luck.